Light ceramic packing－the washing benzene tower,the desulfurizer specialized packing. Light ceramic packing which has light bulk density, large surface area,low resistance,can incise,high temperature resistance and anti-corrupting.It is widely used in coking industry to washing benzene,washing ammonia,decarbonization,desulfurizing and so on. Light Ceramic Packing’s density is 1.1 g/cm3,bulk density is 0.4 g/cm3,it is much lower than ceramic packing and metallic packing.So it have light weight in operating. Structured packing,light ceramic packing in the benzene tower which the gas flux is 50000 meter / three hours, it does the lower resistance is smaller than 50 millimeter mercury columns, the operation resistance is smaller than 100 millimeter mercury columns.So it is not easy to jam,has overcome the shortcoming which it is very easy to break up and jam for random packing. According to the result which testing the light ceramic packing’s capability,light ceramic packing has a large mass-transfer coeffieient,a high water adsorption,a good adsorption performance. In the washing benzene tower,it can form a thin liquid film in the surface after washing oil spraying,in addition light ceramic packing’s big surface area,it form a giant gas liquid exchange membrane space which can make the sufficienty touch between the benzene in gas and the liquid membrane of light ceramic packing’s surface,then let them dissolve fastly in washing oil and recycle the beneze.Because of the low water adsorption,not good adsorption performace of ceramic packing,plastic packing and metallic packing,the liquid is directly currented in the tower,the resort’s time is short,so the using impact is not as good as light ceramic packing. 3.Light Ceramic packing－Endure the aging,strong corrosive resitance,a long using lifetime. 4. 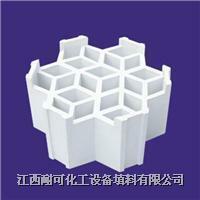 Light Ceramic Packing－The low transport cost and maintenance cost. When we examine and repair the packing tower,light ceramic packing can use high temperature steam to blow,thereby it can be shorten the examine and repair time greatly.However other packing,for example,teller rosette ring which must be pulled out from tower, then using the high pressure squirt gun to clear away which is time consuming and hard sledding, the transport cost and maintenance cost are high.